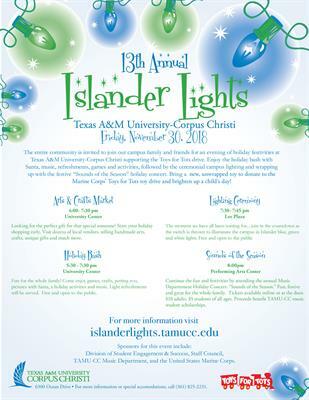 Now in its 13th year, Islander Lights at Texas A&M University-Corpus Christi takes place Friday, Nov. 30, and features four activities: the Arts & Crafts Market, Holiday Bash, the Lighting Ceremony and the Music Department’s Sounds of the Season holiday concert. Stop by the Holiday Bash at University Center between 5:30-7:30 p.m. to take a photo with Santa before heading over to Lee Plaza for the Lighting Ceremony to watch as the entire campus is illuminated in Islander blue, green and white lights. While on campus, be sure and browse a wide range of handmade art and crafts creations as well as unique gifts offered by local vendors at The Arts & Crafts Market, which runs from 4-7:30 p.m. in University Center. The event wraps up with the annual Music Department holiday concert, Sounds of the Season, beginning at 8 p.m. in the Performing Arts Center. Arts & Crafts Market: University Center from 4:00 - 7:30 p.m.
Holiday Bash: University Center from 5:30 - 7:30 p.m. Lighting Ceremony: Lee Plaza from 7:30 - 7:45 p.m. Sounds of the Season: Performing Arts Center beginning at 8:00 p.m. 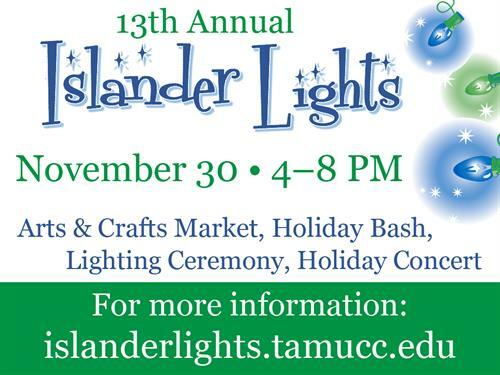 The Arts & Crafts Market, Holiday Bash, and Lighting Ceremony are free and open to the public. Tickets are Sounds of the Season are available online or at the door, $10 adults, $5 students of all ages, 4 and under free.